Use Purdue University’s network of prominent alumni and top faculty to foster your personal and professional success. The Purdue Executive MBA programs have one of the largest international student bodies and will provide you with ample opportunity to enhance your international network. Also, as an Executive Education student, you benefit from career management support provided by the Krannert Professional Development Center. 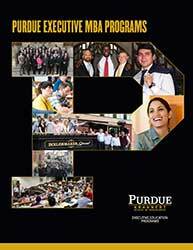 A Purdue Executive MBA is a valuable investment for your employer. The costs of managerial obsolescence are higher in today's business environment than ever before. To remain competitive, a company must not only renew and upgrade its physical assets, but also nurture and improve its management resources. The foundation upon which the Purdue Executive MBA programs rest is a conviction that successful managers must learn throughout their careers. The analytical skills and understanding of managerial concepts we teach you will contribute to your organization’s competitive strengths today and into the future. Becoming more visible to your employer, peers, and to others both inside and outside your organization requires gathering every skill you can and developing proficiency for solving problems by thinking creatively and analytically. An EMBA from Purdue will serve as a catalyst, setting you apart and opening doors of opportunity for you and your company. New opportunities for your company and career – the average ROI is 121%. "Below is a list of benefits to my company from the program. Managed operations team to quickly implement production line that cost $100,000 that will add $2,000,000 in sales for 2016." Create a high-performing team over two year period by hiring 60% new talent to fit department strategy and company culture/vision. 25% of the new hires are IMM Global EMBA alumni." "The program, through its analytical and financial classes, allowed me to find more profit in my sales territory, and allowed me to negotiate win-win terms with some of our largest customers. Being able to give them a financial analysis has allowed me to grow my gross margin profit over 5% while still showing our customers a cost savings. My Purdue EMBA gave me credibility to help my team increase overall sales by 10% and shorten the sales process by more than 10 days, vs. typical sales cycles of 90-plus days." ﻿"We have created a platform of process improvements through workload assessment and efficiency gains. This has allowed us to improve productivity/efficiency with human capital by 17% while improving upon our quality performance metrics in our operation." Increased cross-sales per client across the bank from 2.5 products to 2.75 products (10% increase)."